It’s been a long while since my last newsletter. It’s not that I’ve been idle, rather, more preoccupied with other aspects of my life. I’ve been somewhat less motivated to keep my nose to the grindstone, and more inclined toward spending time with friends and family, and recreational pursuits like playing bridge, enjoying the outdoors, and reading good literature. My commitment to societal improvement remains, but I realize that it is necessary to have the proper balance in life in order to be both happy and effective. Now that 2017 is behind us, we can be hopeful that 2018 will bring better conditions and new opportunities for progress in our work. To find out, watch my 15 minute video, which was extracted and adapted from a longer recording of A World Without Money and Interest: A pathway toward social justice and economic equity, the presentation I made to the International Institute of Advanced Islamic Studies, in Kuala Lumpur, Malaysia, on October 10, 2016. It describes how communities and businesses can escape the debt trap and become more resilient and self-reliant? New independent approaches to payment and reciprocal exchange are being deployed which are making conventional money obsolete. It’s not as complicated as you may think. Many thanks to Ken Richings for doing all the hard work of editing and preparing the video for publication. 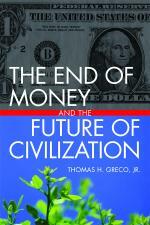 I’ve also posted another excerpt from my book, The End of Money and the Future of Civilization. This one, taken from Chapter 15, Commercial Trade Exchanges—Their Present Limitations and Potential Future, describes the ways in which present practices of commercial trade exchanges are limiting their own growth and development. A long-time correspondent recently alerted me to a video that was made during my tour of the Pacific Northwest in 2003. It is an interview on Network X, in which the late Jeff Fairhall and I spoke about Democratizing Money. This is still every bit as relevant today as it was back then. You can find it on YouTube at https://youtu.be/l4zVbNig–g. During the first part of 2017 and the last two months of 2016, I participated in a cooperative living experiment in Tucson with two friends and colleagues, Susan and Jock. Susan is an author, administrator and grant writer, and Jock is an expert in community living and the founder of Kalikalos. We took a 6 month lease on a house in central Tucson with the intention of working out some alternative possibilities for seniors to age in place in a supportive community, and to take a first step in establishing a learning center that I call the E. C. Riegel Institute for Sustainability and Financial Innovation. With Susan’s expert help, we submitted a couple grant proposals for funding the Institute but did not manage to get a grant, so by the end of April when our lease expired, the experiment was wrapped up and, as planned, we scattered. Susan moved back east to be closer to her son and daughter, Jock developed some health problems so he chose to move into an assisted living community in Marin county California, and I moved into another shared house in Tucson. I maintain regular correspondence and collaboration with many in my peer networks but I’m finding it impossible to keep up with all the email I receive, so I’m having to be more selective about what gets answered. Also, there continues to be a steady stream of groups and individuals asking my advice about their ideas for a new economy, community currencies or credit clearing exchanges. As you might imagine, many of those who contact me have only a germ of an idea and little background in the principles of economics, money, finance and exchange. I try to direct them to resources (my own and others’) that are appropriate to where they happen to be on the learning curve, but there are a few who seem better prepared and have demonstrated abilities in related fields that I choose to work with more intensively. It’s hard to assess the ultimate impact of these efforts, and I’m still hoping to connect with social entrepreneurs and funders who are willing to take my advice to create and take to market an exchange system or currency that is sound, credible, effective and scalable, one that can adequately demonstrate the real potential and effective enough to be widely replicated. In the meantime, I keep trying to improve my communication skills so that people can better understand, not only what is dysfunctional about conventional money, banking and finance, but also the principles and technical details required to realize the great potential of private currencies and moneyless exchange systems. Last year I published the Solar Dollar white paper, and I will soon be publishing another article in which I will try again to clear up the most common misconceptions, and help the next corps of social entrepreneurs to avoid repeating the old recurrent errors. 2017 has sure been an interesting year geopolitically, with Trump’s tweets, Russiagate, North Korean weapons tests, mass killings, and continuing U.S. interventions in the middle-east and elsewhere, giving the pundits plenty of material to yack about 24/7. U.S. politics is playing out like a melodramatic farce. The executive branch seems to be a house divided against itself, and the political landscape is undergoing a seismic shift. The Trump presidency has shaken things up and it’s difficult to predict what might happen next. The corporate and banking oligarchs seem to be getting enough out of Trump to accept (for now) his presence in the White House, but his rejection of the Trans-Pacific Partnership (TPP) and his coziness with Putin and the Russians must be exasperating to them. It’s getting ever more difficult to sort out the real facts from the fake news and propaganda. If you get your news solely from the main TV channels, newspapers, and magazines you’re getting only a small part of the big picture and are thereby being misled. For a more complete picture, one needs to study history, listen to whistle blowers, and consult independent authors and commentators, and foreign as well as domestic sources. My current list of recommended sites and sources is here. It’s up to you to decide what makes sense and what to believe. As one sage told me long ago, “Don’t believe everything you hear, and only half of what you see.” Over the past several months, I’ve posted five segments in a series I call, What in the world is going on? Go to my website, https://beyondmoney.net/, and search on “What in the world” to find them. Finally, regarding the economy, since the 2008 financial crisis the central banks have been inflating asset bubbles in stocks, bonds, and real estate by their policies of market interventions (quantitative easing) and low interest rates. Now they are making noises about raising interest rates and reducing the size of their balance sheets (by selling securities), but I don’t expect they will be able to go very far with those moves without causing more economic distress. They are more window dressing than real policy shifts. The Republican tax bill which was recently passed into law will, in the short run, add to that bubble inflation by giving the rich and the corporations additional funds which they will mainly invest, not spend. Corporations, rather than raising wages or building new capacity, will likely use much of the windfall to buy back their own shares. That added demand will keep stocks pumped up for a while longer. But nothing has been done to remedy the flaws that are inherent in the global system of money, banking and finance (MBF), which in fact have been made worse. Another financial crisis is surely on the way and it’s likely to be more severe than the last one, but when it will break is difficult to predict. Everyone wants to know how to protect their nest egg. My general advice for communities is to convert financial resources into resilient infrastructure that provides a steady stream of necessary goods and services. But what can individuals do? An inflationary depression is the most likely scenario, so keep enough cash on hand to last a couple weeks and hold some liquidity in a credit union account, but invest a major portion of your money in real things that will be useful and hold their value no matter what. For more detailed advice about that you can read my post Survival Strategies for Troubled Times. I’m excited to be back in Greece and reconnecting with my colleagues here. The mood here seems to be more subdued as the people try to cope with asset privatization, wage and pension cuts, higher taxes and other conditions imposed from outside. I’m told that mortgage foreclosures will begin soon, which may trigger some popular reaction. The metro workers in Athens have announced they will be striking for several hours each day over the next few days. Fortunately the hours of service disruption have been posted so one is able to plan accordingly. All of this underlines the urgency of designing and implementing systems that are capable of devolving power to the national, community, and personal levels. For me, the most effective strategy seems to be reclaiming the “credit commons”. That is what we will be working on during my workshop on innovation in exchange and finance from 24 June thru 1 July, 2016 at Kalikalos Holistic summer school near Volos, Greece. Space is still available if you would like to participate. Details about the course, fees, and booking are at http://www.kalikalos.org/exchange-finance. Don’t let finances stop you; we will be able to offer a limited amount of bursaries (Please write an application to our team rachaeldavson@gmail.com). Special arrangements for Greek participants provide them (1) a discount of 33% on the full course, or (2) for those who can participate only on the weekend of 25/26 June, an invitation to do so on the basis of a free will offering. developing action plans for the design and implementation of robust systems that can be widely proliferated and quickly scaled up to global dimensions.